I received a very interesting synopsis from a senior executive at one of the major global IT-BPO providers on the subject of Poland as an offshore delivery location. From my own personal experience, Poland has proved to be a first-class location for high-quality, multi-lingual support, particularly for BPO functions such as finance and HR. No wonder providers such as Accenture, ADP, Capgemini, Genpact, HCL, HP and IBM have all made significant investments there, in addition to many captive centers that have been established there in recent years. “Move Over, India: The Shifting Geography of Offshore Outsourcing Creates New Challengers” stated an article published by the Wharton School, way back in 2005. Every now and then a prominent analyst, consulting or a research firms comes out with a report on alternatives to India as far as offshoring is concerned. Today, Latin America and Eastern Europe are integral to the Global Delivery Models of most organizations – both for their in-house IT/Business Processes as well as outsourced IT/Business Processes. In this context, it is interesting to analyze the case of Poland which is the largest of the new European Union member states. Poland is not a substitute to India for anyone seeking scale:The fastest ramp-up that a company has achieved in Poland is about 500-600 FTEs during a year - this equates the average weeklyramp-up of some of Indian companies in India (26,000 during the year) and half of peak-day hiring (TCS last year and Cognizant this year made about 1000 offers at Anna University in a day). Hardly Attractive for Outsourcing from the US:6-7% appreciation of the INR (Indian Rupee) against the USD created a hue and cry in India with NASSCOM almost portraying it as a threat to the industry (INR has already depreciated to be back to cheaper than earlier levels). The Polish Zlotych had appreciated in excess of 30% against the USD in 18-months! Even though there has been USD appreciation over last few weeks, I am not sure of many business models which can take a hit of 25-30% and still remain viable. More a BPO than a ITO Destination:Poland's is essentially a BPO/Shared Services industry with ITO being restricted to smaller scale Polish players (even with significant presence of IBM and Cap Gemini, their ITO work is not that significant, and focus is more on BPO - primarily Accounting Services). Even among BPO/Shared Service centers, captives form more than half the industry which is very distinct from the India story. Skill Scarcity: If you sought help from any leading recruitment consultants for hiring people with 4-5 years experience even with common technology skills, they would suggest that it requires a ‘direct search’ as it is a "senior level" hiring placement. Initial offers from consultants mentioned rates of 20-25% of annual salary – you could almost hire a VP on those terms in India. I found this shocking but then it was easy to understand why. A software engineer, business analyst or a transition manager with 5 years experience is a European resource rather than Polish or a Romanian resource and hence cannot be source of any cost arbitrage. Poland makes up its lack of scale through superior quality: Poland has 45% of its population, in relevant age groups, in its universities; compared to only 10% in India. Moreover, until recently, it did not have graduates, but only post-graduates - hence the quality of human resource in BPO and shared service centers is far superior to most such centers in India and other European nations. Most BPOs hire post-graduates in Economics and Finance from top institutes for their operations - a luxury which may not be available in India other than to some high-end KPO operations (see this earlier discussion). Ability to attract a truly global workforce: In our organization we not only have a multi-lingual workforce, but a multi-national one which includes Portuguese, Spanish, Russian, Italian, Brazilian, British, Polish and Indian nationals. This gives it an advantage which most Indian operations do not have. While most companies currently leverage this facet largely to source language skills, it has the potential to be extended to other areas in the future. Poland has far greater potential than simply being a multi-lingual hub: I have talked to outsourcing heads of two leading financial institutions – one European and other American – who acknowledge that their Global Operating/Delivery Model is almost a euphemism for an India-strategy backed by couple of other locations for work that cannot be done out of Indiaeither due to EU or local regulatory restrictions or foreign language requirements. 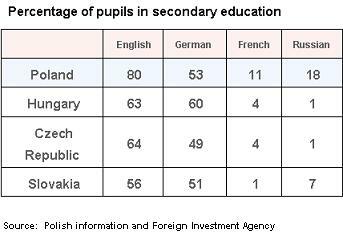 The language skills advantage is significant but if that remains the key driver of outsourcing to Poland, then some really bright Masters in Economics would be in an accounting operation for a German client – not because she knows econometrics but because she knows German. In fact this ‘alternative offshore location’ positioning is unfair to a country like Poland which offers really unique benefits. With the strength of its education system and ability to attract global talent, Poland should challenge the niche positioning of a country like Israel in high-end technology or other niche skills rather than be a generic offshoring destination. This is a great posting - thanks for sharing. I like the comparison with Israel, as Poland clearly has far greater potential than merely being an administrative BPO location. Which provider does the author work for? According to the Ernst & Young report, Poland achieved first place in Europe in terms of availability of industrial sites, cost of land and regulations. In terms of flexibility of employment regulations Poland is placed second after UK and third in terms of corporate taxation. Bigger than all other 9 New EU members put together (2004 – excludes Romania and Bulgaria which joined EU in 2007). Only country in Eastern Europe with expansion potential beyond a single city (Prague in Czech Republic; Budapest in Hungary etc.). Over 90 billion euro available for development, infrastructure and human capital. Currently poland hosts leading global companies in IT and BPO: Accenture, IBM, Cap Gemini, ACS Captive Centers of UBS, State Street, Philip Morris, Shell, Lufthansa, HSBC. A lot of the info here echoes the experience of one of my clients, which has been slowly building up a captive presence there. They are generally very satisfied with the quality they are getting, and hoping to move more work there, BUT (there's always a but), their efforts have been stalled by the dollar's free fall and the ability to recruit fast enough to move as much as possible over from other European sites. In selecting a BPO location inside the European Union and in India, its useful to first segregate the City-level metrics from the Country(EU)/State(India)-level metrics and then quantify relative-importance of each metric vis-a-vis others, specific to your unique need. Eventually, the one-on-one negotiated govt. subsidy/incentives (thru PaIiz in Poland, CzechInvest in czech rep, SARIO in Solvakia etc) for job creation, is the salient country-level metric for BPO new entrants. Other-wise, its best to focus on City-Metrics to develop a meaningful point of view on a BPO location inside the EU. For eg., if you seek to set-up a 500 seats+ BPO venture in the location you select then, its best to validate break-even point for the handful of cities with 300K+ population. 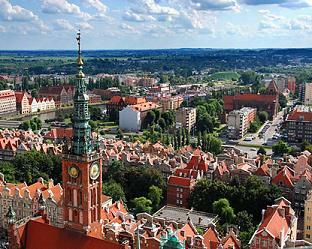 Poland & most other CEE present several interesting BPO locations even today. Just as in other industries, the BPO industry too will eventually progress towards a "stateless multinational mindset" ( Refer - http://www.economist.com/opinion/displaystory.cfm?story_id=12263150 ). One should mostly trust the NUMBERS of one's business model, in BPO location selection, within the EU. Inputs to the model are mostly at a city-level. Comments on a Nation as a BPO location in Europe, still invite a lot of nationalistic demagoguery. As philosopher AC Grayling reminds us - " Nationalism is an evil. It causes unncessary wars, its roots lie in xenophobia and racism, it is a recent phenomenon - an invention of the last few centuries. The word - "nation" - is meaningless: all nations are mongrel, a mixture of so many immigrations and mixings of people over time that the idea of ethinicity is largely comical. " Its fairly common these days to find nations present themselves aggressively (thru their investment cells like Paiiz, czechinvest, sario etc) at BPO conferences in the CEE region. A new & meaningless war of words has been underway for the past 5 years. We need to rise to a stateless multinational mindset.